CAN'T WAIT TO GET TO THE WOODLANDS? CATCH THE FLIGHT TO FIREFLY TOUR FEATURING FIREFLY INDIE ROCKERS HIPPO CAMPUS AND THE SOULFUL SAMIA! Minnesota band Hippo Campus was named one of NPR's favorite new artists, and have been making waves not only with their lively music, but also by taking a stand on social issues. They have thus far donated merch profits to The Women's Foundation of Minnesota in support of the #MeToo movement, and to Normal Parents and Everytown For Gun Safety by selling "thoughts and prayers" t-shirts to raise awareness. 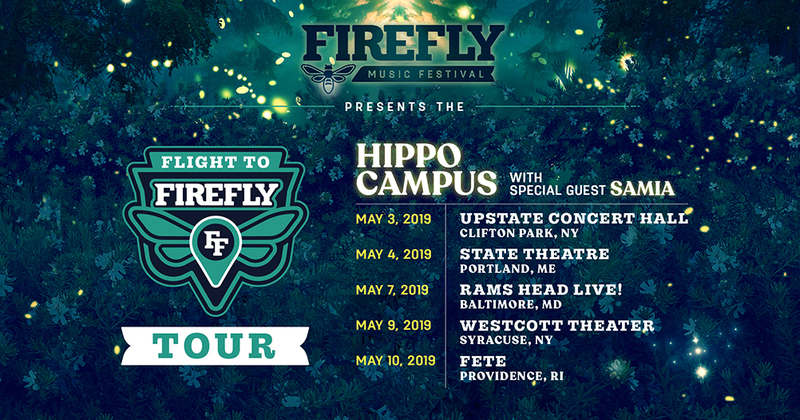 Check out Flight to Firefly and the entire Hippo Campus "BAMBI" tour here.